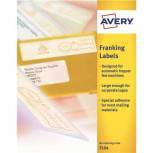 Avery Franking Label QuickDRY 140x38mm 2 Per Sheet White (Pack of 1000) FL01 Pack of 1 Avery Franking Machine Labels FL01. Adhesive labels for use with manual feed franking machines. 2 labels per sheet. Total 100 Labels. Label size: 140 x 38mm. 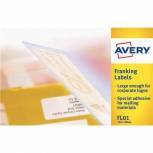 Avery Franking Label QuickDRY 140x38mm 1 Per Sheet White (Pack of 1000) FL04 Pack of 1 Avery Franking Machine Labels FL04. Adhesive labels for use with Franking machines with automatic hoppers. One label per sheet. Label size: 140 x 38mm.